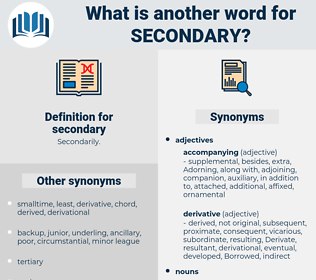 What is another word for secondary? second-, complementary, second-largest, colleges, Pupils. responsibilities, outcomes, definitions, averages, Ones, Activities, points, situations, events, months. 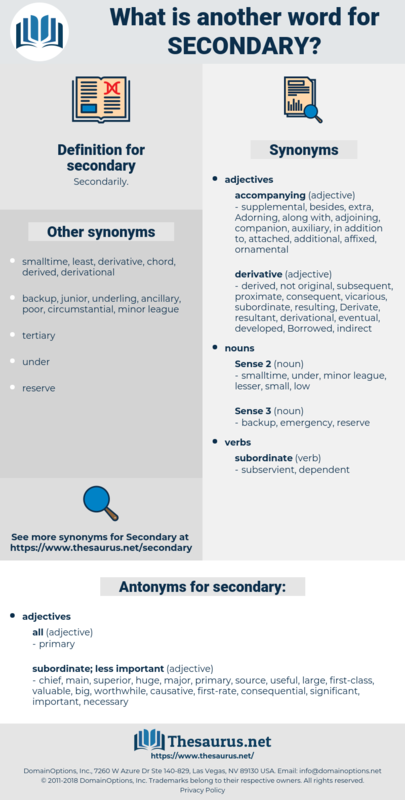 secondary-level, second-round, second-level, post-primary, second-tier, high-school, second-rate, second-class, second-degree, secondhand, incidental, derivative, subordinate, second-order, peripheral, spill-over, middle-level, junior, supplementary, Medium-sized, adverse, Subordinated, sub-prime, indirect, second-line, tertiary, intermediary, preparatory, marginal, subservient, medium-level, subprime, mezzanine. grades, reactions, streets, secondaires, colleges. chief, important, huge, significant, necessary, major, causative, first-class, useful, big, large, source, worthwhile, main, consequential, valuable. choice, premium, adequate, select, selected, first-rate, greater, high-grade, more, sufficient, exceptional, dominant, fundamental, first class, superior, acceptable, higher. There is no middle ground - no division of the canon into books of primary and of secondary authority. He felt with a sudden pang that in this rescue of Patsy he was playing a very secondary part. second-year, smotherer, squinter, saunterer, snow tire, sinter, sociometry, signature, squander, Simhath Torah, saunter, senator, sentry, squanderer, symmetry, sundry, seconder, sanitary, Simhat Torah, signatory, snow thrower, smatter, sinatra, smoother, somateria, some other, sunder, sonometer, sonneteer, sender, sequenator, snow eater, semi-dry, scimitar, smother, sander, shunter, sounder, sumatra.